Most of the time, users come up with different challenges while searching a particular MSG email from the bulk set of MSG files. It is quite obvious that users get annoyed as they need to sit and manually perform the searching process, which is quite tedious. If you are a user who is facing similar such situation to search and view the MSG file, then this blog is the ultimate solution for the same. In this MSG Advanced Search write-up, we will disclose the best procedure to find any keywords or phrase into MSG files in a seamless way. All-Rounder Solution for Instant Searching of a Specific MSG file! No doubt, a user needs to face a tough time in finding the appropriate MSG file when there are bulk MSG emails. Under such a situation, there is no need to panic and waste time in the manual process. Instead, make the best use of MSG Viewer as this tool is loaded with the set of advanced features that let users search a particular email in a trouble-free way. 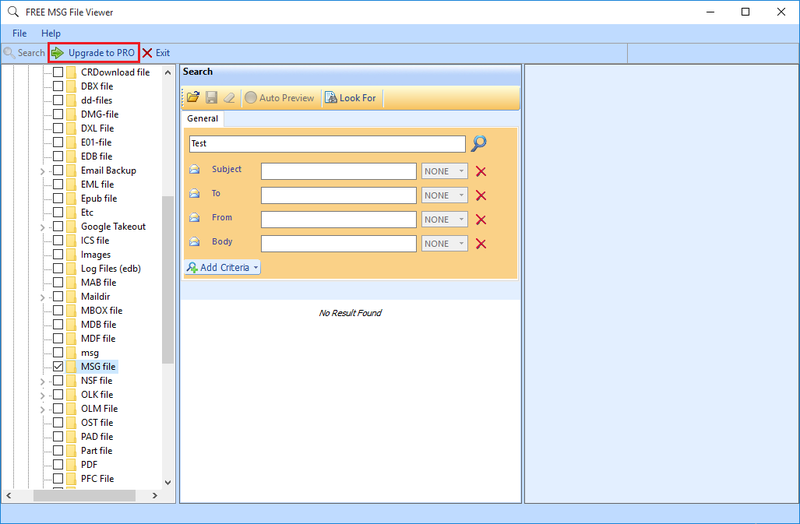 This standalone software is perfectly designed to perform MSG advanced search from the bulk Outlook message files without installing any MSG supported email programs like MS Outlook, Exchange Server and so on. Furthermore, the tool permits users to search the relevant MSG email by taking the least time possible. It’s time to bury all the manual worries to search MSG files using MSG Viewer tool! This software let users search the required MSG email from the large set of MSG files efficiently. For that, a user must provide the appropriate inputs in the given fields. These fields include Subject, To, From, Body. In addition to that, one can also add criteria’s to customize the search thereby giving the best and the most precise results in the least time. Besides all these criteria’s, a user can also avail the different operators such as AND, OR, etc that let users to adequately search and find the desired MSG file. Additionally, the tool is designed in such a way that one can smoothly launch the software on the latest Windows 10 and all the previous versions. A user can end up with severe situations to search a keyword from multiple MSG files. Instead of relying on the manual approach, one can quickly perform MSG advanced search with the help of MSG Viewer tool. It is completely a security utility that allows users to efficiently carry out the search process without causing any technical disputes. All the features, which is loaded in the tool is developed keeping in mind the various downsides that are associated with the manual method.